Headtorches are amazing, although I think I’m using mine in a strange way. It’s still attached to my head, but I’m using it to do the gardening. At this time of year it is really difficult to find the daylight to carry out some tasks. I leave the cottage in darkness, and I return in darkness. 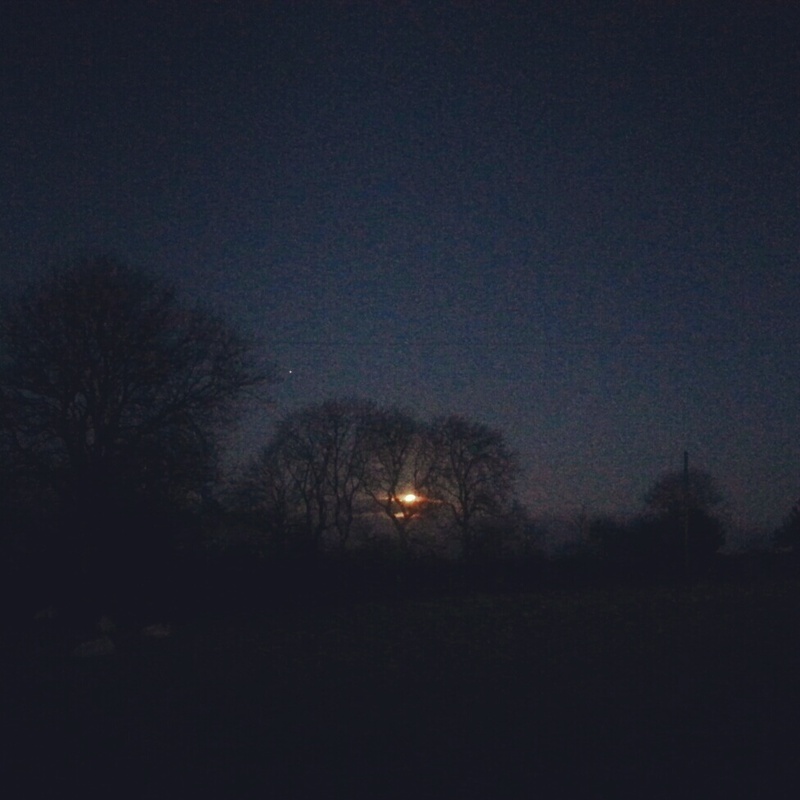 Although, this morning I found my journey partially lit by a setting moon. The moonset has been a feature of our mornings for the last three days. I first caught it resting on the edge of the horizon on Monday as I got out of bed. As we darted about getting washed and dressed, I called the lovely Sharon to the window, “come here and see this”. She sighed, “really? I don’t have time for this.” Then when she arrived at the window the moon cast its spell and she paused, rested her head on my shoulder, and we watched for a minute or two. It’s too easy to let these moments slip by. By the time I arrived home today the moon was a bold feature again. Under this Celtic ‘Dark Moon’ I slipped on my headtorch, grabbed a spade and pickaxe, and headed out into the garden to dig a trench. I need to put in sixty feet of hedge and apparently the winter is the best time to plant them. In the summer I toyed with the idea of planting this hedge but suspected that it was a dream due to the expense of buying the trees. After a little research I stumbled upon conservation ni where I could get sixty trees for a total cost of thirty pounds! They only sell local species, but this was exactly what I want anyway. I hope to plant sixty trees which are a mixture of hawthorn, blackthorn and dog rose. With the order in I have only a short time to prepare the ground. Under the moon I wondered how ridiculous I must have seemed if any neighbours caught sight of my headtorch bobbing about. I imagine that it is suspicious to be digging holes at night and under a full moon. 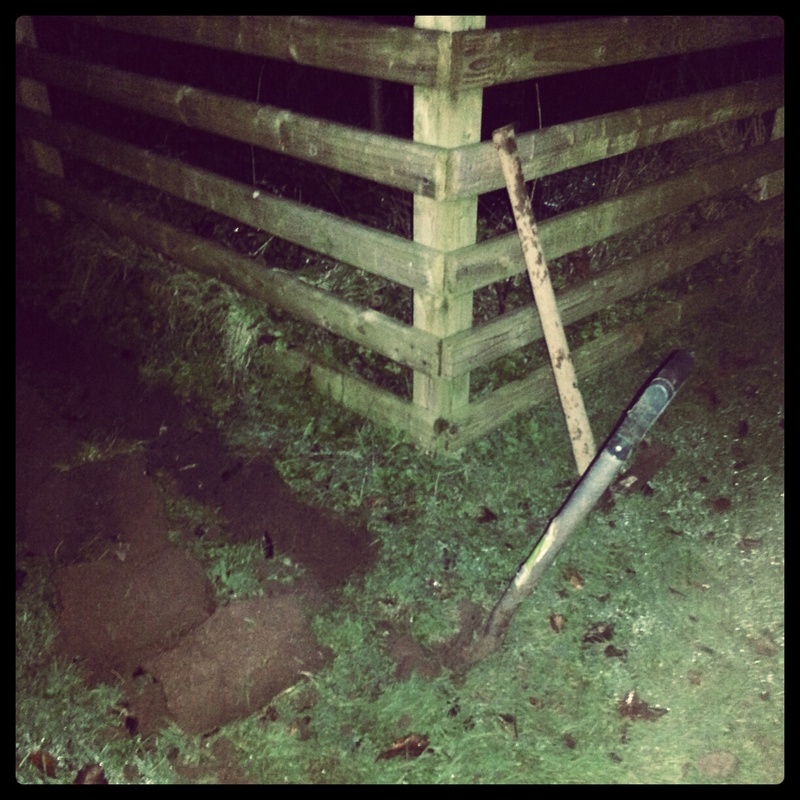 And, in truth, it was only a few days ago that I buried a dead body in the back garden. I tried a little cheating today. Is it possible to make sourdough without the epic wait for a culture of wild yeast? I tried a little experiment to discover/eliminate one option. 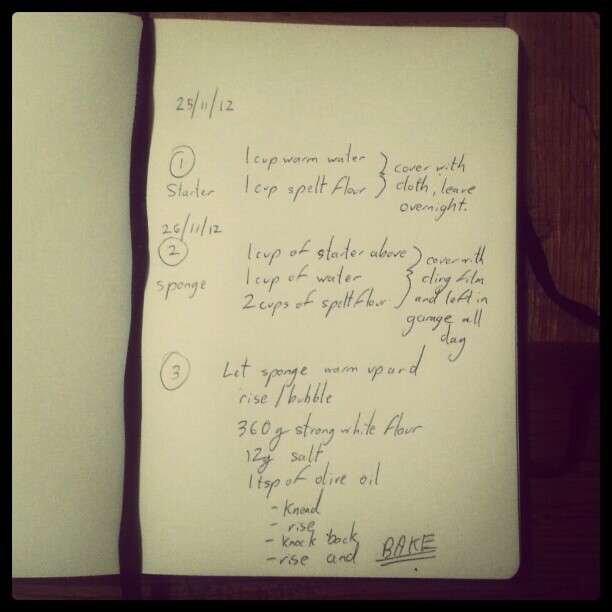 The recipe above omits the 15g of yeast I added at the start, a vital ingredient. It grew overnight and then spent the day in a cold garage. The theory is that the yeast slowed down but the bacteria that is found naturally carried on and added some sour flavours. 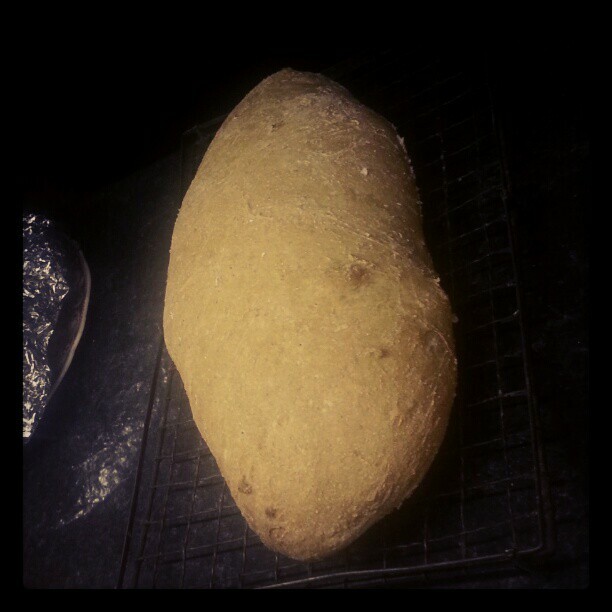 After a little rewarming in the house the yeast began to bubble again and the bread was made. It’s cooling now and the cottage certainly smells like sourdough, but it’s late. The tasting will have to wait until the morning. So there I was reading the little man his bedtime book. We delved into the realms of story and make believe, a world with morals and lessons around every corner. 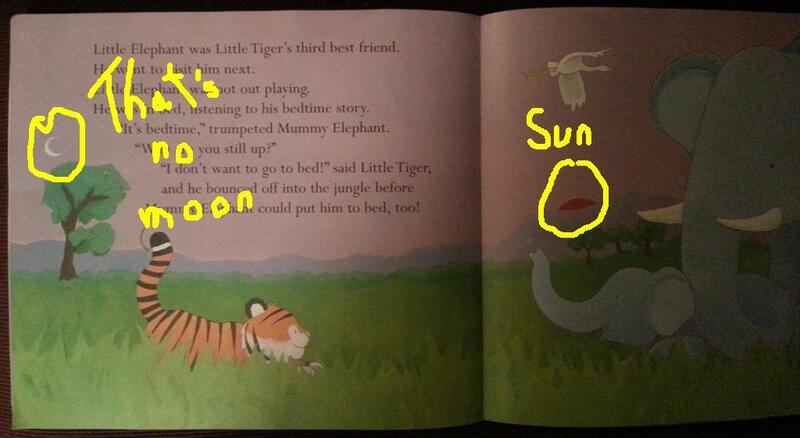 This particular story (spoiler alert) was about a tiger who did not want to go to bed. His mother decided to let him learn his lesson and told him he could stay up all night. He went searching for his friends, the lion, hippo, elephant etc. only to find them all in various stages of bedtime preparation. Eventually he wandered back home exhausted and regretting not going to bed. 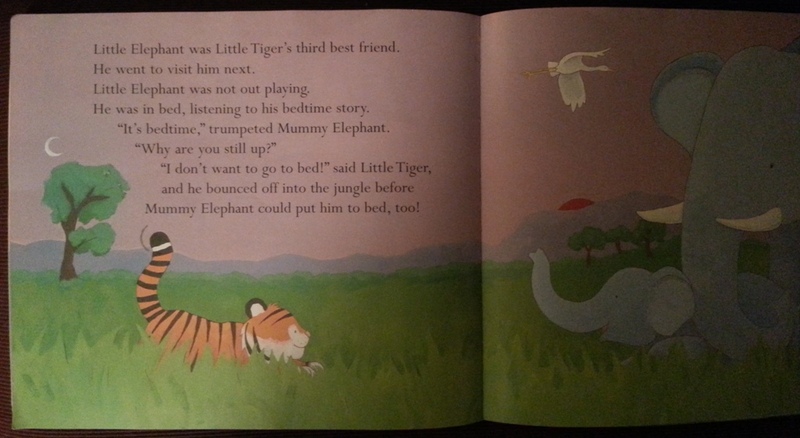 This was a nice little story which was spoiled by the visit to the elephants. I know there is something wrong with me, but seeing the moon like that upset me so much. It could not be unseen. With the setting sun on the right the moon should be a crescent facing the other way around as it is lit up by the sun. The same realisation happens when I see actors drinking from empty cups. It ruined it for me. I know it shouldn’t upset me, but it does. There are some unexpected aspects of pregnancy that you don’t read about in books. One of these is the ratchet effect. This is a consequence of having a large bump and having to sleep on the left side of your body. For many nights now I have observed the ratchet effect in the lovely Sharon. She lies on her left side until she feels uncomfortable. Then she turns onto her back momentarily before turning back onto her left side. When this happens the bump takes the bedsheets with it. When this repeats itself over and over in the night it leaves me with the edge of the sheets feeling cold. For some reason I just let it happen and i’m not sure why. It could be that it forces me closer to her so that I can bury my nose in her hair. The tickly-ness of her hair is worth enduring for the lovely smell. Or it could be because I am scared of waking her and facing the anger of the ratchet. On Thursday morning I stepped out to carry out the morning chores and no-one stepped out of the garage to meet me. 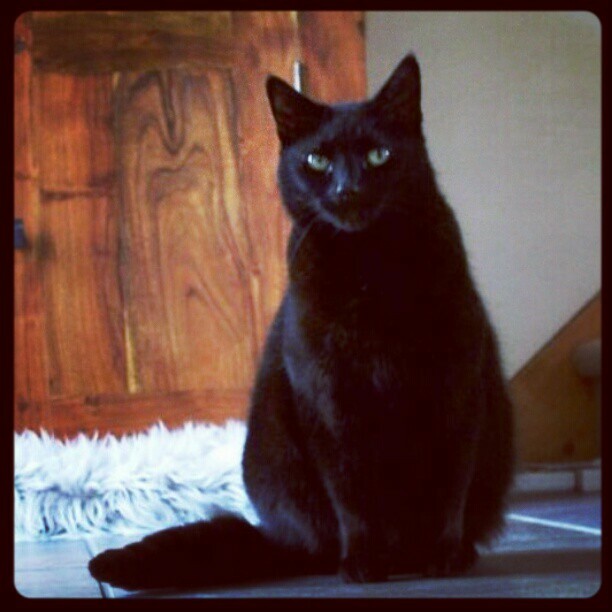 The greeting of our black cat crying for breakfast is as constant as the sun and moon. On Thursday she was not to be seen, in my heart I already knew something was wrong. On thursday evening she was missing again and in the winter darkness I went hunting for her. I dug a hole under one of the apple trees. I choose a young tree so as not to disturb mature roots and also, although the thought disturbed me, to give a boost of growth to the growing tree. My pragmatism disturbed me. She was gone. She slipped away from us in her sleep. From her pose it was not a cold curled sleep. It was not a sleep of illness or pain. It was a relaxed and deep comfortable sleep. As I looked at her in her cosy bed I kept expecting, wished for, her body to rise and fall and let out her usual deep snore. Tille was a wonderful little cat. She was always at my heels in the morning and evening as I pottered around the cottage. When we walked down the lane she would always follow in all kinds of weather. On a few occasions she even followed us to our neighbours and waited obediently outside their door, more dog-like than cat. She loved scratches under her chin, her fur was always soft, and when I put my nose to her forehead she always smelled beautifully of grass and warm earth. I had to lift her and I hesitated. 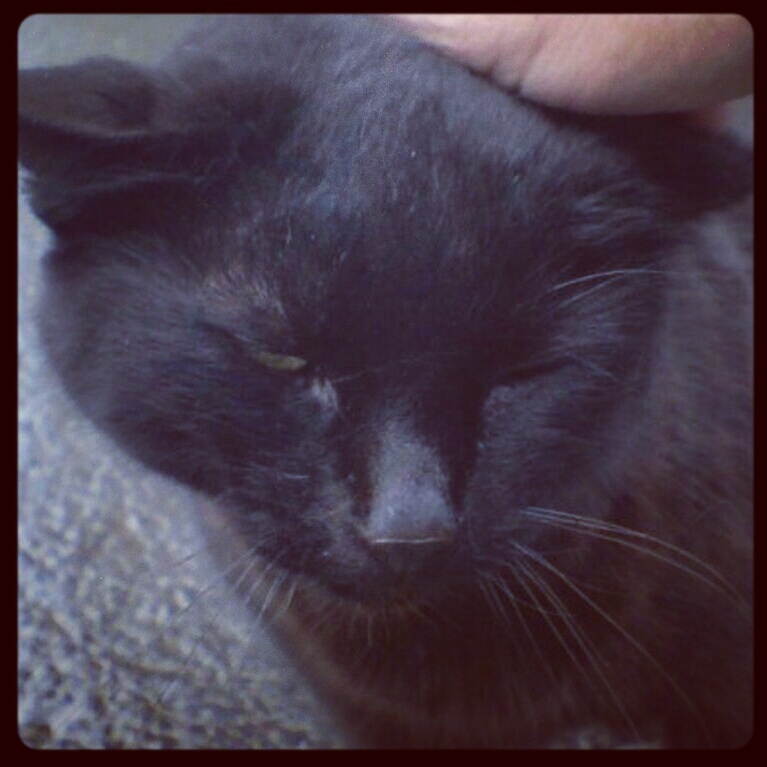 This was our dearest pet. She was gone and what was left was only death. I hesitated and did not want to touch death. With these hands I had taken life, the life of our livestock, but in that moment I was afraid of death, as if death was something contagious. I lifted her, and although I knew this was an empty shell, I caught myself appologising to her. I caught myself crying and saying, “I’m sorry girl”. I set her underneath the apple tree. She still held her sleeping pose and this was not lost on me, this eternal sleeping. They say pets teach children about many things including death. I’m not naive enough to think that it is only our children they teach. I can’t remember anything about Thursday morning apart from her absence and a small part of me preparing myself for the possibility. The evening was different. I remember it all in detail. 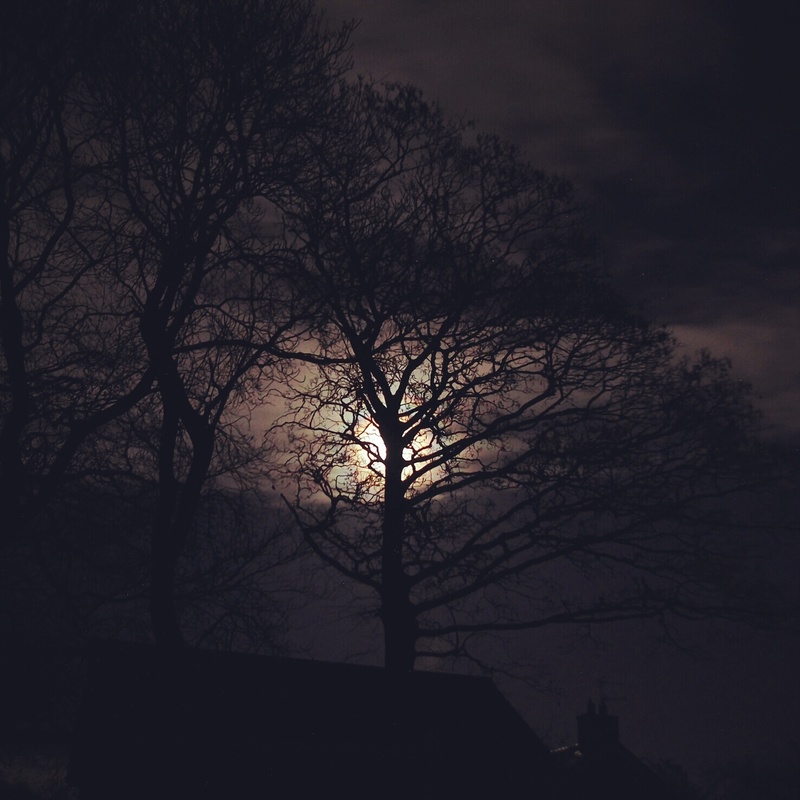 In that waukrife moment I remember the dark, the moon hanging over us, the bare branches around us, the woodsmoke in the air, and the cold clotted soil piled up. I remember the feeling of loss and I remember her sleeping deep in the earth. Somewhere in the middle of the night a sound split my sleep. 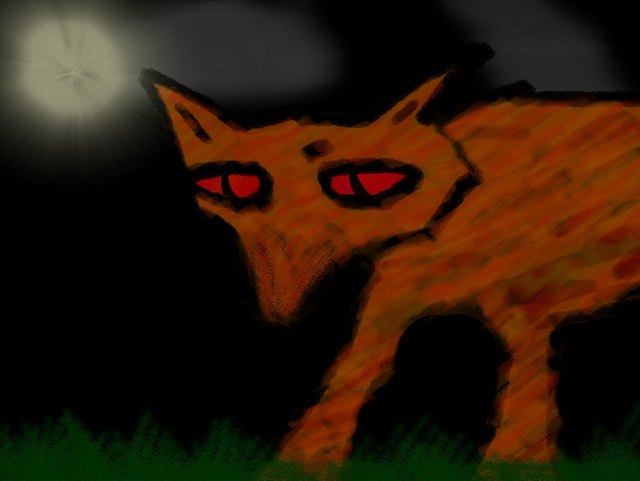 The rattle of sprung chicken wire and claws on wood meant only one thing; the fox. After the crashing of wire there was a few frustrated whines that sounded half dog wuff and half cat meow. I lay awake for a while and listened to the winter night. The sound I expected was silence, the sound I feared was the possibility of chickens being eaten in their sleep. There was only silence. One of my students brought a fox with him on his journey to school the other day. His own chickens were being menaced. He purchased a fox trap and happened to catch it without bait after the chickens had pottered in and out of it all day, leaving only their scent, enough for a famished fox. Just before arriving to school he released it far from its home, far from the menaced flock. The cold will be stirring up a hunger in all the creatures on these long nights. The birds strip our feeders daily. If there is a shred of light left by the time I arrive home from work I try, in vain, to identify some of them. I have an identification chart opportunistically left by the window as I am poor at twitching, apart from crows. For some unfathomable reason I know the species of crows, the corvids, and can name them all from a distance. I once felt like a bit of a freak when I met a friend of a friend and I happened to have my nose deep in a book about the fine details and habits of ravens. He was an avid twitcher and mistook me for one of his kind. I didn’t really know how to explain that I didn’t know a sparrow from a finch, unless it was black and had eyes that burn with wild intelligence. Even if a crow did want to visit the bird feeders, then it would be uncharacteristic and futile. If there is a thin fade of light when I arrive home all I usually see is three empty feeders hanging pathetically, stripped bare like fish skeletons after a piranha attack. If the foxes are driven by the same hunger as the finches and sparrows, or whatever they are, then they have a high fence to vault over. I have also started up the winter habit of locking the chickens into their shed. This is to kill two birds with one stone, a poor choice of words. It is to give them added protection and to keep out the cold night air. This sounds lovely and caring until I reveal that I am only human and love to be lazy. At the weekends I cannot face getting up to let them out before dawn. At the weekends they have an open hatch, a cold night, and the clawings of predators on the fence.